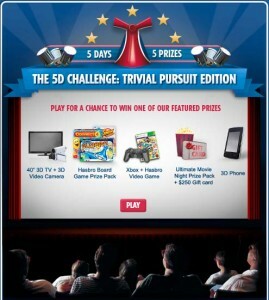 Contest participants who correctly answered three movie-themed trivia questions from Hasbro’s popular TRIVIAL PURSUIT game were entered into a drawing awarding a different prize each day over the course of a week. 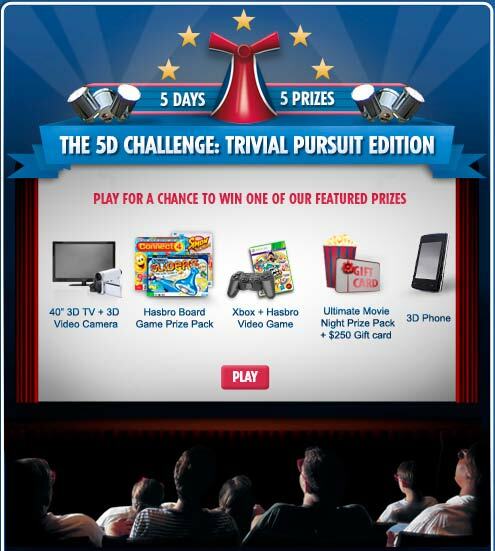 Susan Gutierrez – Melbourne, Fla.
Tuckman Lau- New York, N.Y.
Chris Stewart – Mount Lake Terrace, Wash.
Angela Palmer – Miramar, Fla.
Carnival Breeze’s Thrill 5D Theater provides guests with a multi-dimensional experience that will make them feel like they are actually in the movie. The attraction combines a high-definition 3D projection system with 4D elements such as squirting water and bubbles, and special effects that tickle guests’ legs and poke them in their seats. Seats will vibrate, shift back and forth and move from side to side, creating an exciting “fifth-dimensional” element. Guests will receive special 3D glasses that deliver a truly immersive movie-going experience. The Thrill 5D Theater is just one of several on-board features available on the 3,690-passenger vessel, which will be the first in the fleet to include all of the entertainment offerings introduced as part of Fun Ship 2.0, a $500 million multi-ship enhancement program that will dramatically transform Carnival’s on-board guest experience. These exciting options include Hasbro, The Game Show, a series of larger-than-life adaptations of the brand’s popular iconic games; Playlist Productions, which combine captivating live performances with high-tech LED staging and special effects to set a new standard in seagoing entertainment; “The Punchliner Comedy Club Presented by George Lopez,” a partnership with the popular comedian who is acting as a consultant on the vetting and hiring of talent for the line’s comedy program. Additionally, DJs on the Carnival Breeze will be trained under the new “DJ IRIE Spin’iversity” led by DJ IRIE, a talented disc jockey widely known in Miami and Las Vegas. Other features on the Carnival Breeze will include Guy’s Burger Joint, offering hand-crafted burgers and fresh-cut fries created by renowned chef and Food Network star Guy Fieri; RedFrog Pub, featuring Carnival’s own private-label draft beer – ThirstyFrog Red; Cucina del Capitano, a family-style Italian eatery; and a host of other exciting dining, bar and entertainment options.